Not be confused with the Brooks Range, Mt. 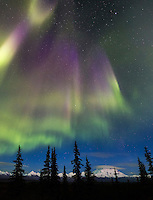 Brooks is a mountain in the Alaska Range, situated east of Mt. Denali. It is situated at the confluence of the Muldrow, Traleika, and Brooks glaciers. It has a distinctly symmetrically shaped summit when viewed from the north end of the famous Wonder Lake in Denali National Park. next » | 111 sample images from this category. Try a keyword search to see them all. 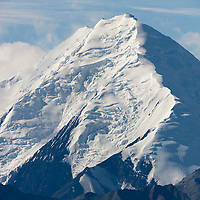 Mount Brooks, Alaska Range, Denali National Park, Interior, Alaska. Clouds cap mt Brooks of the Alaska Range in Denali National Park, Alaska. 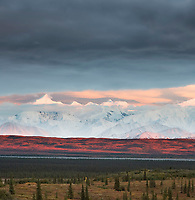 Mt Brooks of the Alaska Range, Denali National Park, Interior, Alaska.